Kansas guard Devon Dotson was flat on his back, slithering in the lane, both hands balled into fists. He screamed out in pain. Three teammates gathered around him, just before he scrunched his face again, which led to another grimace. For a second time, he howled. In the 45th minute, his legs had finally given out. 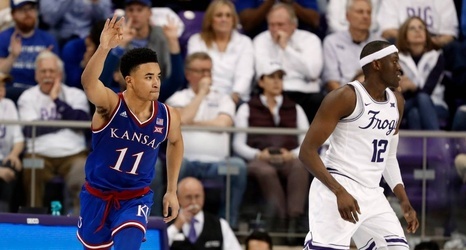 Dotson’s right calf was cramping, and after drawing a blocking foul to earn two free throws, the KU point guard struggled to get to his feet. This was right in front of the Jayhawks’ bench — during the final seconds of overtime — and KU coach Bill Self leaned in to share some words.